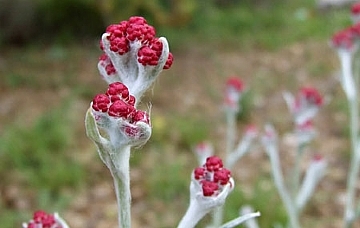 Red Everlasting/Red cudweed "Dam haMacabim"
During the seven week period between Passover and Shavuot, while some flowers of the early spring have begun drying up, blooms the plant Helichrysum sanguineum, in English the Red Everlasting/Red cudweed, called in Hebrew Dam haMacabim, or Blood of the Maccabees. Dam haMacabim belongs to the family of Compositae, the second largest family in the plant world, which includes about 1,000 species, and about 2000 different varieties. Plants of this family are characterized by dense collection of tiny flowers, clustered together, for example, the Chrysanthemum, the Groundsel and the Anthemis. 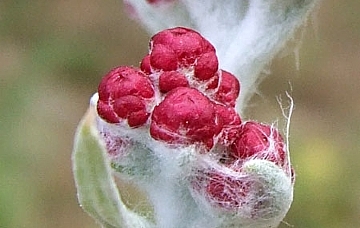 Some of the flowers in the family are "tubular" and narrow while others are more "tongue-shaped" (with a single tongue-like petal), and are located primarily within the cluster of flowers. Dam haMacabim, unlike other flowers of the family, contains a collection of yellow tubular flowers, very close together, wrapped in a red cover which we can see, thus giving the flower its characteristic color. These covers which protect the flowers are slow to fade, and remain the color of blood for many weeks and can be preserved. For this reason, this flower is often used around the world for ornamentation. On Mount Hermon in northern Israel is an exceptionally rare form of the flower, the Mountain Dam haMacabim. 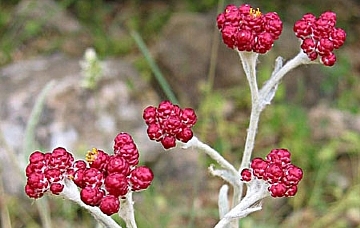 The vision of the plant’s stem ending in a cluster of reddish balls drops, reminded Ephraim and Hannah Hareuveni, (the parents of Neot Kedumim founder Noga Hareuveni) of drops of blood, so they named the plant Dam haMacabim, ‘Blood of the Maccabees’. This name was accepted by the Academy of the Hebrew Language. Although the name of the plant was introduced in 1923, years before the Holocaust, and before Israel’s Independence and subsequent wars to defend her existence, Dam haMacabim connects Israel’s constant struggle for security today to the age old struggle for agricultural existence in Israel, battling complex and unpredictable weather as well as the external forces which attempted to keep us away from the Land of Israel. The Maccabees were the first to bring the spirit of freedom and independence to people of Israel in their homeland. The unique determination continued from generation of the Maccabees until to generation of Israel’s independence in 1948. For this reason the Dam haMacabim was chosen as the symbol of Israel’s annual Memorial Day.